Zoos are fascinating and educational places for families to spend a day. Children are especially captivated by animals, particularly animals that are new or unusual to them. Zoos have a wonderful effect on adults, too. Breeding endangered species in captivity to reintroduce them into the wild is a goal for several zoos. Modern zoos want teach visitors the importance of animal conservation, often by letting visitors witness the animals firsthand in exhibits that closely resemble natural habitats. California’s biggest cities are home to some of the best zoos in the U.S. Founded on October 2, 1916, by Harry M. Wegeforth, M.D., San Diego Zoo Global is a not-for-profit organization that operates the San Diego Zoo, the San Diego Zoo Safari Park, and the Institute for Conservation Research. Visiting this expansive zoo in San Diego is a chance to see one of the world’s finest facilities for seeing and learning about rare and endangered species. Animals are housed in carefully naturalized enclosures spread across 100 acres in Balboa Park. More than 3,700 animals from 650 species are showcased here, including crowd-pleasers like giant pandas and fuzzy koala bears and intriguing oddities like naked mole rats. Info: http://zoo.sandiegozoo.org · 2920 Zoo Dr. · San Diego, CA 92101 · (619) 231-1515. The Living Desert was established in 1970, knowing resort development would have significant impact on their local desert ecosystem. For almost four decades, The Living Desert has been engaged in the important work of preserving, conserving, and interpreting the desert along with all its varied plant and animal life. Talk about survival skills: the animals and plants on show at the extraordinary Living Desert Zoo and Gardens displays amazing adaptions that make it possible to survive in the desert’s harsh environment. Observe more than 1,400 species of cacti, yucca, and other desert plants that grow in California’s Mojave and Sonoran Deserts, as well as other deserts around the world. You’ll see and learn about desert animals too. African meerkats rise up on their hind legs, swaying as they pivot their heads and sniff the air. Desert foxes, with enormous bat-like ears, curl up tight for afternoon naps. And giraffes crane their necks and stretch out extraordinarily purple tongues to nibble on grasses outside their enclosures. Info: http://www.livingdesert.org/ · 47900 Portola Avenue · Palm Desert, CA 92260 · (760) 346-5694. The Oakland Zoo was founded in 1922 by naturalist Henry A. Snow. In 1936, Henry’s son, Sidney, established the nonprofit organization East Bay Zoological Society, which was originally known as the Alameda County Botanical and Zoological Society. The East Bay Zoological Society has operated and managed the zoo as a nonprofit organization for the City of Oakland since 1982. Over the past twenty-five years, the East Bay Zoological Society has undertaken significant improvements to improve animal care and the visitor experience. 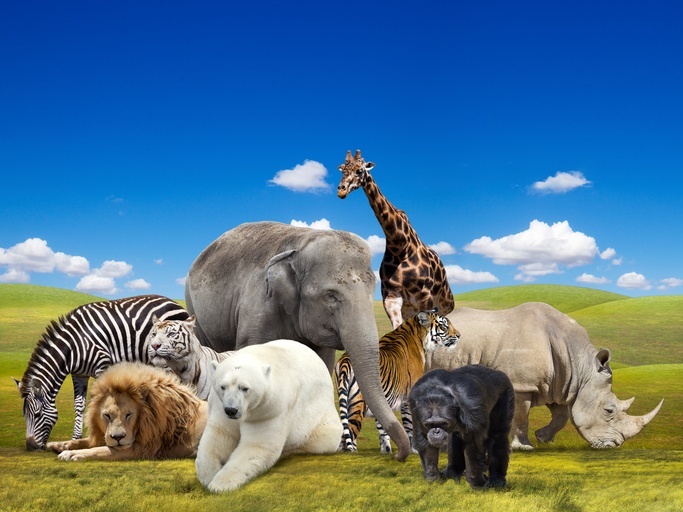 Animals live in expansive habitats made to closely resemble their native living conditions. Observe tigers in a naturalized enclosure or elephants in their own splashing pond. The Oakland Zoo is home to more than 660 animals, grouped in unique habitats: Adventure Landing, African Savanna, African Veldt, California Trail, Flamingo Plaza, Tropical Rain Forest, Wayne and Gladys Valley Children’s Zoo, and Wild Australia. Info: http://www.oaklandzoo.org/ · 9777 Golf Links Road · Oakland, CA 94605 · (510) 632-9525. Safari West began in the late 1980s when Peter Lang purchased 400 acres in the foothills of the Mayacamas Mountains. After relocating his small but growing collection of exotic wildlife, Peter converted the former cattle ranch into a world class conservation breeding facility. A 1½-hour drive north of San Francisco, the African wildlife at this park will amaze even seasoned safari-goers. Giraffes, rhinos, zebras, wildebeests, gazelles, bongos, and other incredible animals roam rolling hills and woodlands in this expansive park. Dozens of birds also call the park home, including cranes, flamingoes, ostriches, and storks. Guests board small vehicles to tour the park with informative guides, and you really don’t know what will be around the next corner. Visitors of all ages also enjoy closer encounters with some of the park’s animals. For a memorable experience an overnight stay in a deluxe safari-style tent, with plush beds, private bathrooms, and a natural soundtrack outside is available. Info: www.safariwest.com · 3115 Porter Creek Road · Santa Rosa, CA 95404 · (707) 579-2551.